The original Christmas plans were on a larger scale, but sometimes life interferes. Back in November, I had been feverishly planning a trip to Vermont to spend Christmas with my friend and his 6-year-old daughter. What a grand time we'd have - especially Emma and Duncan. They'd ride in the car and play with the kid and take walks in the snow. Then Emma suddenly died in mid-November. Duncan and I went into mourning. A month passed in slow motion. While I was still in shock, mice moved into my house and used everything in their path as a toilet. I caught some with traps and finally, in desperation, I resorted to poison laid out in closets blocked from Duncan's prying nose. A few weeks before Christmas, I was shampooing mouse droppings off the back of my couch by the light of the Christmas tree. Now the pitter-patter of little mouse feet was suddenly replaced by the unmistakable odor of dead mice in the vents. I lit scented candles at each vent - creating a bizarre mix of evergreen scented death, cinnamon death, sugar cookie death. As Duncan and I huddled miserably on the damp couch watching Christmas TV, I decided that I must salvage this hideous Christmas somehow. I went to the store and bought lights for the outside of the house - first time ever. The choices were mind-numbing and the electrical set-up required advanced extension cord skills. After five visits to the hardware store, I had what I needed and nearly froze my fingers off installing the tangled mess in freezing rain. The porch rails were wrapped and lights dangled from suction cups inside the dormer windows. I put the dormer lights on timers and crawled under furniture to plug in the porch display - one cord for each side of the porch. It was semi-festive - a low budget fairy tale - but I thought the effect was magical. The next day, two cheerfully lit dormers welcomed me home and a few embarrassing plug-in positions later, the porch was twinkling merrily as well. The next day I came home a bit earlier and the house was winking at me - one lit dormer shining through the night. I never did get those timers synchronized. The house blinked on one window at a time for weeks while the neighbors taunted me. I counted the days until Duncan and I would escape to Vermont, our Christmas paradise. This trip would save Christmas. I knew it would. Then one night as I was watching the needles drop off my tiny tree, I felt the unmistakable sore throat that heralds Michigan's first flu of the season. I was supposed to leave in just a few days. As I chewed on vitamin C and pondered my fate, the weather channel tracked a massive Nor'easter heading up the coast. I didn't care. Duncan and I were going to escape the death house for Christmas. No mouse bodies, no errant lighting. I told my friend it was no big deal. The only tricky part was getting through Buffalo's lake-effect snow. I assured him that the good people of Buffalo knew a thing or two about snow and they could handle whatever came their way. That night Duncan got sick. His tummy gurgled and he couldn't sleep. He would lie down and moan and then get up and moan again. I thought about Emma. She'd suffered massive liver failure but none of the vets tending her had found out why. "Probably an auto-immune problem. These things just happen." But now it was 3 in the morning and I was standing watch over Duncan, who was finally asleep. The next morning he was fine, but I rushed him to the vet anyway. He was poked and prodded and his blood was tested. Nothing was wrong. Maybe it was nervous tension or maybe it was a booda-bone chunk that was not sitting right on his tummy. In any case, it was the last straw. I could not fight my way east through a blizzard with a fever and dog who might be ill. This cursed Christmas had won. Over the next four days Buffalo got six feet of snow and closed the freeway I would have traveled. So, it was a countdown to Christmas in the death house after all. My nearly naked tree and inept lighting went nicely with the slightly faded smell of decaying mice. My temperature soared and my joints ached. I took to watching home shopping networks all day. On Christmas morning I finally felt well enough to make one last attempt at cheer. I baked some chocolate cookies because, as everyone knows, chocolate makes everything all right. And to Duncan's surprised delight, I whipped up a bunch of weenie treats. As a dog who is allergic to almost everything used in commercial dog treats, Duncan lives a meager deprived existence. 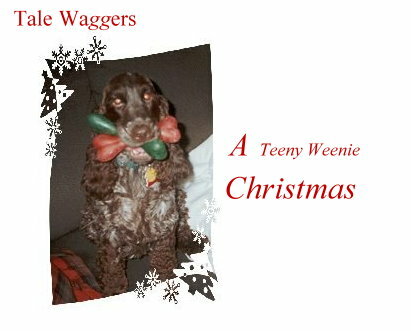 When his aunt Sandy came up with Weenie Treats his life was transformed. Weenie treats are nothing more than hot dogs (chicken franks for Duncan because he's allergic to beef) sliced into thin disks and microwaved or baked until they become leathery or even crisp. There is no right or wrong way to make weenie treats and every dog I know goes wild for them. Just keep them in a jar or baggie in the fridge and your furkid will love you forever. Now the house smelled just like you'd expect if you'd been baking wieners all day - not your traditional Christmas memory. I tied a haphazard bow around Duncan's neck and headed over to the neighbor's house with cookies and weenie treats for their dog, Jessie. Jessie's people gave Duncan a large stuffed alligator toy. I gave Jessie an obnoxious cow toy that actually mooed. I hoped the spirit of the season would keep her family from knocking me silly with it. Duncan discovered that teenage Jessie was now tall enough that he could walk between her back legs and literally grab her cow out from under her. Then Jessie and Duncan played that popular dog game, "Just try and get your toy back", racing behind furniture and running over, and under, each other. Duncan would be smugly gnawing the cow when suddenly the alligator's squeaker was heard from behind the couch. And they're off! In just 30 minutes both pups were exhausted and heavily panting with wiener scented breath. We headed back to the house of Christmas horrors. There was a light dusting of snow and the sun was shining. I wished Emma was there with us, but Duncan and I were the whole pack now, and the pack was together. We'd been knocked around, but we were not beaten. We went home and settled back on the couch. I ate enough cookies to put a rosy glow on any day and Duncan had more weenie treats than I usually allow. They gave him the most outrageous gas, but he didn't seem to notice. He just curled up beside me, snoring and passing wind. It brought tears to my eyes in more ways than one. Our teeny weenie Christmas was complete.